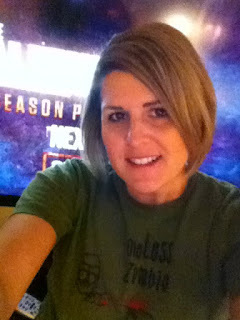 One Less Nemesis Blog: Walking Dead season 3 premieres! We were sportin' our One Less Zombie tees last night for the Walking Dead Season 3 premiere! 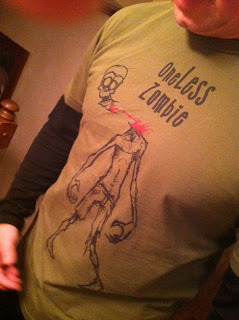 We sold some shirts for $5 off during the ep and enjoyed all of the gore and eye-poking-out zombie fun! I was on Twitter and saw some really great tweets, like @HeidiCF8 who coined the term "inzombnia" for the sleeplessness caused by watching TWD. And there was this tweet: from ‏@holytaco "Please let some zombies start singing an a cappella "In the Jungle." Join us next Sunday on Twitter for more Walking Dead fun and discounts!